The proposed Canada-to-Texas Keystone XL Pipeline has become a political football. The Republican-led House of Representatives insists the pipeline be “fast-tracked.” The Obama administration wants time to study alternative routes and make a final decision in 2013. The Federal Energy Regulatory Commission (FERC) generally has authority over interstate pipeline projects, however, given the pipeline crosses an international border, the Department of State has to sign off. In addition to sending products from Canadian tar sands, the Keystone XL would also pick up domestic oil from Montana and North Dakota’s Bakken formation at a pipeline intersection in Baker, MT. In August, Nebraska Republican Governor Dave Heineman wrote a letter to Secretary Clinton and President Obama urging them to reject the pipeline’s permit application, citing concern for protecting the Ogallala aquifer (map). In November, in response to resistance from Heineman and environmental advocates, the administration announced the delay. Those who hope to protect the Ogallala Aquifer from potential contamination by oil pipelines are too late. There are already numerous pipelines crossing it, especially in Oklahoma and Texas. This map (click for larger view) shows pipelines carrying oil (green), natural gas (red), and “products” (blue) such as gasoline, propane, and ethylene. Two petroleum pipelines, C18 and C19, already cross east-west through Nebraska and the Ogallala Aquifer. Aside from the groundwater protection concern, many oppose additional oil infrastructure and advocate for cleaner energy. Natural Gas Vehicles for America is a trade organization that aggressively advocates for fueling vehicles with natural gas or hydrogen. According to their website, there are currently 112,000 natural gas vehicles (NGV) in the US and over 13 million worldwide. The excellent energy blog The Oil Drum ran an interesting article in 2009 on the feasibility of converting all our vehicles to natural gas. The prospects are good, but installing conversion equipment on cars and trucks is expensive. It turns out one of the pricey aspects of the process is an outrageous permit fee the EPA imposes, allegedly at the behest of the “gasoline lobby,” on mechanic shops that would retrofit vehicles to burn natural gas. The permit fees greatly add to the cost. This year, Nebraska opened a new compressed natural gas (CNG) filling station in Omaha, the only CNG station between Denver and Chicago. Two more CNG stations are planned, one in Lincoln and another in Omaha. One will be operated by Omaha’s public utility, Metropolitan Utility Division, which is a co-sponsor of ngvc.org’s website. Other options exist for moving oil and bitumen (the stuff from tar sands) to refineries. New rail terminals are getting built in North Dakota and barges are carrying crude down the Missouri River. With oil at about $100 per barrel, folks will find ways to get it to market. 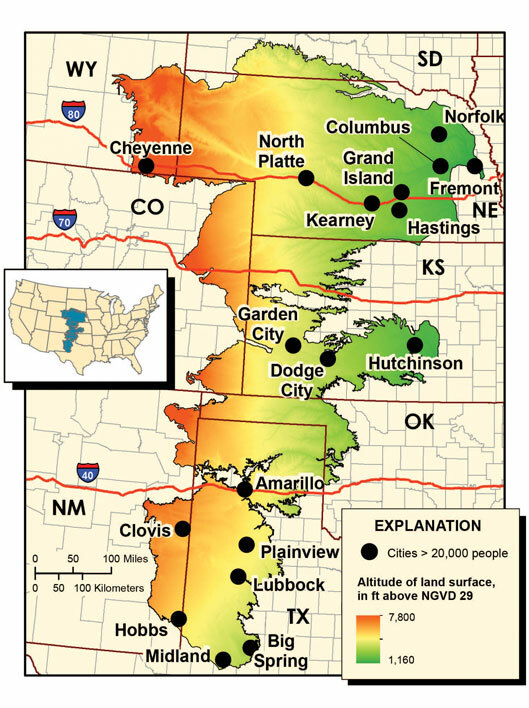 Note that the issue is not so much the Ogallala aquifer in general but passage thru the Sand Hills region where the ground water is only a few inches deep in the hollows of the region. There are no pipelines crossing this fairly wild region of Nebraska, Yes they could have decided to run the pipeline further east and missed this area but it would have cost 500 million more they say. However Nebraska has said if you don’t move the pipeline we won’t give you the state permits to build it. And this is a republican governor and legislature. Thanks for the comment, Lyle. The Sand Hills region is a big concern and the preferred Keystone XL route crosses it. The existing Platte Pipeline, which runs from Guernsey, Wyoming to Omaha (and beyond) looks like it crosses the Sand Hills region, as well. The Platte pipeline has been in service since 1952. Kinder Morgan Canada operates the pipeline and I have no information about their monitoring and maintenance program, but I think it’s reasonable to have some concern about the structural integrity of a pipe after 60-years in the ground. Checking the maps the Gurnsey to Omaha route, skirts the south edge of the SandHills, Essentially following the route of the UPRR Powder River Line to North Platte, and the UPRR original line most of the way to Omaha. The sand hills start a few miles north of the Platte river, (For example look at North Platte Ne. The river route has been a corridor for commerce since the days of the Oregon Trail, In fact I suspect one could say the pipeline essentially follows the Oregon Trail route, which went to Casper, Wy and then up the Sweetwater River to South Pass. Thanks for the comment, Lyle. Sharing of existing utility corridors is almost always preferable to cutting a new pipeline route. Running the Keystone XL south from Baker and then parallel next to the existing Platte (Guernsey to Omaha) pipeline seems to make more sense than the current proposed route, depending on other less obvious factors. I have no real way to evaluate the eifccafy of POTUS statements, however, we can evaluate the fruits of not approving the Keystone Pipeline. You summarize it quite well, however, with all due respect it is actually much worse.If these policies aren’t reversed we have likely done worse than simply “ticked off” Canada. You see the global realities are Canada needs a customer for this oil much more than China needs to be buy from Canada. Every business person knows the key to success is keeping the customer happy and keeping the supplier happy. In this case, the supplier needs the customer much more than the customer needs the supplier. As such, this relatioship heavily favors China. Canada will want to keep the Chinese customer happy. The Chinese will not make this free. We should expect Canada’s foreign policy to gravitate toward what Bejing would approve of. Essentaily we should expect China to become actively hostile to the United States in the coming years. If Mr. Obama and his team had ANY business acumen, they would have seen this result of not approving the pipeline coming from a million miles away. Hopefully these policies can still be reveresed by Mr. Obama changing course or by a new POTUS but it may already be to late. The deal between China and Canada has likely already been agrred to. In the short to mid term we should expect a large contingent of Chinese forces to be deployed to Canada arrayed in a way where they can threaten America. The exuces will be that it is being done to protect China’s oil supply. The media will buy it and will be just fine with it. In reality, these forces will be sent to threaten America. All of this is easily predictable by anyone with any business sense. Mr. Obama either has no such sense, is evil, or is blinded by his ideology. My guess is that the end game is a pipeline from Alaska down to the lower 48 and this part is just part of the play. Going or not going across the Sandhills is not going to stop a pipeline being built to access the material in the north. The Arctic shelf has oil&gas that can only be extracted viva pipeline (they flair the gas they “produce” in Alaska) . Can we afford that kind of waste? Thanks for the comment. Insightful, as usual.